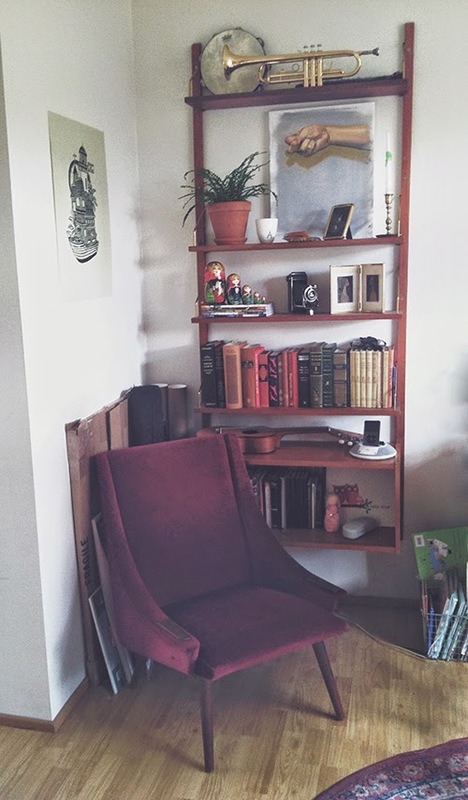 Audrey Elisabet: Heim | Living Room Corner. Heim | Living Room Corner. I'm sitting in my couch, alone, listening to the rain and I don't feel like studying at all. So I am sharing a corner of my living room instead. I am really loving making this little space our own. We add things and change something every week, and it is all coming together very nicely. The downside of being an art student is the papers, canvases and general mess all over the apartment (as seen behind the chair). We try to hide it away as we can but as I am using a lot of the stuff on a daily basis, and some things are to big to put under the sofa, we can't really keep the place extremely tidy. But the mess and artsy stuff might just be a part of what makes this place really ours.